Wow – 6 months almost to the day since my last Noah post (which was about 6 months from the one before). Sometimes it feels like I blinked and got here – and sometimes it feels like an eternity. So much has happened. Last fall, after the horror of getting Noah completely clean – off everything but his seizure med – we began the work of trying small doses of new meds that might help tamp down his erratic and aggressive behavior. No one – not our neurologist, psychologist or psychiatrist – was overly optimistic that this would work, but Mike and I were determined to try. Noah felt so “close”, and we so desperately wanted to keep him in his school. We worked our way through THREE different meds, and then even circled back to one of the original meds he’d been on (reasoning that it might now be more effective if taken by itself). At best, there was no change. At worst? Noah went from being our sweet, happy boy to someone that even his siblings didn’t want to be around. It was awful, and made us realize that there was indeed a “too high” price to pay to keep Noah in his school. That if we lost what makes Noah so special, we were in danger of losing it forever. So we decided that there would be no more meds, other than his seizure med. That we would take our boy “as-is”, and work on all the other factors that were contributing to his struggles. This, of course, meant changing schools. And as devastating as this decision was, it was strangely liberating at the same time. And if you’ve ever dreaded something so much that the mere thought of it was paralyzing – only to have that thing happen, and finding yourself strangely relieved – then you know how this feels. So, starting in December, we pulled back even more – sending Noah into school just for his services, and bringing him home mid-morning. He continued seeing his tutors and going to his afternoon activities. And after another awful few weeks of getting off the last of the meds, we started to see our boy return. 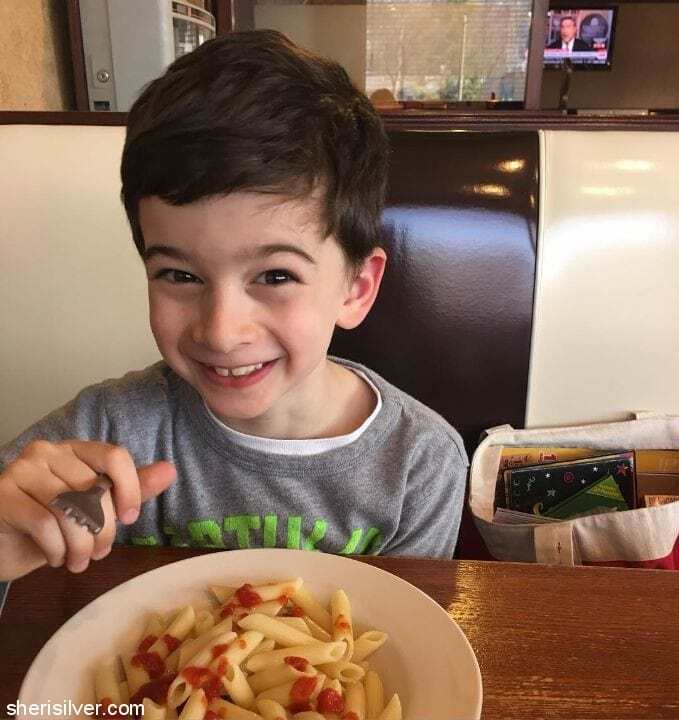 Our school worked with us to find suitable programs in other towns, and in January we started getting phone calls from schools, telling us they’d received Noah’s file and would we like to pay a visit. And one program was more disappointing than the next. It was beyond depressing, and we were beginning to wonder if there even WAS a program that was “just right” for Noah. Between the academic gap (even though it was closing daily), and the social/behavioral issues, he really didn’t “fit” into a specific category. Not learning disabled. Not autistic. Not low-functioning. Was there a place for him? And then we got a call from the very last school on the list. And we went, reluctantly, certain that it would be no better than the others. If you had asked me to describe the “perfect” school for Noah, I would have described a school that was half as good as the one he’s now in. And I would have told you that a school like that doesn’t exist. But for the past 2+ months, Noah has been attending a public elementary school, very much like the one he left. There is a special classroom in this school – run by the most amazing teacher (and her equally amazing staff). It’s where Noah spends time on classwork that is still beyond his capabilities. It’s where he spends time when he’s having a rough day (or even a rough hour). It’s where he can work – in a “real life” setting – on acquiring the social skills he totally missed while in the throes of undiagnosed ESES. Ms. H. and her team don’t just “manage” Noah. They teach him. They work with him. They guide him. And they truly care for him. And the best part? He gets to spend a good portion of each day in a regular 1st grade classroom. Where he attends morning meeting, goes to specials, and participates in lunch and recess. The goal is for him to eventually spend his whole day there, but there is no predetermined date by which this needs to happen. And in the mean time he’s learning, growing, playing and having a “normal” day for the first time in what feels like FOREVER. “Noah had a great day today”. “Noah had an awesome day today”! “Noah had a really rough morning, but turned it around and the rest of the day was great”. Those sentences you just read? We have NEVER heard them prior to these last two months. NEVER. And that last one is – believe it or not – the BEST one. Because – prior to these last two months – a “rough morning” basically meant the end of his day. That it was being shut down and he was being sent home. That he couldn’t recover, regroup, reboot, recoup. But lately? A rough morning is just that. A morning. And he is slowly but surely able to pull himself together and get on with the day – often a really successful day. And we are profoundly grateful to the staff in this wonderful school – who treat Noah with high expectations, consequences to his actions, and demands to be met. But also with so much support, encouragement and kindness. So, you may be wondering, how has Noah been through all of this? Well, initially he was not at all happy to hear that he was going to a new school. And on his first day he was VERY reluctant to get out of the car (the promise of a trip to Toys R Us miraculously took care of THAT). But this kid? A TROOPER. He now bounds out of the car every morning, and comes out happy every afternoon. He talks about his day – what he made in art, who he played tag with at recess – you know, NORMAL EVERYDAY STUFF. He logs a full day. Each and every day. After so many months of barely even being in school at all. And then happily hustles off to his extra-curricular activities (and there is one – sometimes two – every day). Simply put, HE amazes ME. Each and every day. And as for me? Well, I have a ways to go. I still carry my phone from one room to the next. And my stomach lurches every time it rings. I can barely breathe until he comes out of school and I get the day’s report from his teacher. And I worry. About everything. But we’ve come so, so far. And he’s still so young. And after years of toxic crap coursing through his little body, he is CLEAN. So that any and all of his accomplishments truly are HIS accomplishments. Which is incredibly promising. Mike and I continue to lean on each other, and continue to be thankful to the circle of people we have in our lives who never give up on us. Ever. This little guy is our everything. At the end of the day we never give up on HIM because we can’t. We have faith in him because we HAVE to. And we have faith in US. Because we have to. We’re his mom and dad. That is just terrific news! What a great update. The right school and teacher make the difference, and Noah has great advocates in his parents. You and Mike are amazing as is Noah. He’s a lucky boy to have such wonderful parents who not only love him but have the time and energy and resources and grit to advocate and ask questions and never give up. Oh Sheri, This is wonderful news. I’m getting a little misty over here. I can imagine that stress you describe of holding your breath through each day and hoping the phone won’t ring. I’m so glad Noah has found a place that cares for him, teaches him well, and where he’s happy. Sending love your way! So happy to hear that Noah’s doing so well!! Bless your little guy!! Thrilled to hear about Noah’s progress and so happy the right school and teacher were put in your path. Noah, keep growing, learning, playing, and bouncing back. I’ll second what Evette said, You’re my hero. Sheri, I am so glad you posted an update. What a journey. I am so sorry about all the stress and angst you went through. What a gift to have found the right school setting for Noah! I am beyond happy for you all! May it be the smoothest of sailing from here on out. God bless Noah and his amazing parents! Thanks my friend – I know you’re always in our corner and am SO thankful for that!!! Awestruck, inspired, in love & above all, verklempt. What an amazing journey. Noah is one lucky (and adorable) little boy. So many people care about him, including me. Thank you for sharing, Sheri. Thank you so much Jessica. Your amazing family is at the top of our list of “good things” in our lives. Hope to see more of you now that you’re here!